Shea Stadium in Queens was named for William A. Shea, the man who brought National League baseball back to New York after the Dodgers and Giants went west. Citi Field has been named for Citigroup, Inc., the multinational corporation that helped Enron steal money. 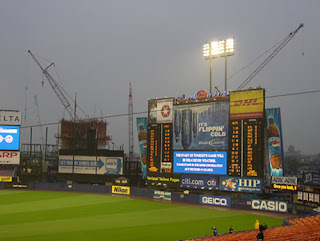 In the bizarro world of the New World Order, Shea is coming down and Citi Field is going up. 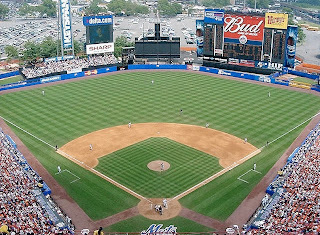 This summer, enjoy a game at Shea before the retro blue and orange stadium is demolished. Before the first pitch, head over to Willets Point, also slated for demolition. If you’ve never been to the Iron Triangle, as this working-man's neighborhood of 250 small businesses is fondly known, now is the time to go. The officially blighted area around Shea Stadium is picturesque for its shanty-style mechanic shacks, chop shops, and junkyards. Think stacks of rubber tires, corrugated tin walls decorated with hubcaps, stray dogs, and guys hanging around in grease-stained wifebeaters. But it’s not as scary as it looks. There are also some cheerful men made out of old mufflers. Wander around. You’ll soon find a welcoming little place where you can get a delicious plate of chicken, beans, and rice. And someday, when the Iron Triangle has a new family-friendly name and is filled with condos, Starbucks, and Cold Stone Creameries, you’ll have this memory to remind you that, one time, a long time ago, New York City wasn’t so stultifyingly dull. One thing you can do, however, is sign a petition to save the homerun apple. Fair enough. But you're aware that Yankee Stadium will be dust in less than two years? And that you and I are spending $660 million (and counting) to subsidize King George's million-square-foot mallpark? And that no one seems to care? I join your well-presented lament over the New York that is disappearing. But be grateful you live in Manhattan. The destruction of a landmark the scale of Yankee Stadium wouldn't happen there--not to mention paying a private business to raze public parkland. Yes, I miss the bookstores and pubs, too. But I will miss Yankee Stadium much more. thanks for the tip--i had heard this but there doesn't seem to be much talk about it out there, so i figured it couldn't really happen. right. i will definitely give it my attention. Well, if they could level the Polo Grounds and Ebbets Field, what makes Yankee Stadium so special? Especially true because they mutilated the place after 1973. Babe Ruth himself would not recognize anything about "his" house, what-so-ever. Yankee Stadium disappeared with the 1973 "renovations". The montrocity left in it's place was mercifuly short lived and will be coming down. I just wish it was coming down because the Yankees were moving across the country instead of across the street.